This contemporary residence is located in Montfavet, 9 km from the centre of Avignon. 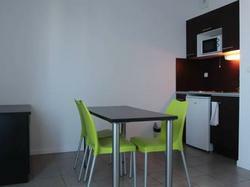 Free Wi-Fi access and an LCD TV are provided in these self-catering studios and apartments. A microwave, stove and a fridge feature in the kitchenettes at the Appart'Hôtel Avignon Campus Del Sol. Free toiletries are provided in the en suite bathrooms, which are fitted with a bathtub or a shower. The continental breakfast is prepared every morning and served in the cafeteria, and laundry facilities are available on site. Garden Avignon Golf Club is just 1.5 km away and private parking is possible on site. Exit 24 on the A7 motorway is an 11-minute drive from this residence. Please note that breakfast is served from Monday to Friday. Please note that reception is open from 08:00 to 12:00 and 15h15 to 19h00, Monday to Friday. Guests arriving outside of these times will be sent an email after booking regarding the key collection. This studio has a balcony, kitchenware and tile/marble floor. This quadruple room features a balcony, soundproofing and stovetop. This apartment has a balcony, view and stovetop. This studio an equipped kitchenette and a private bathroom with shower. An air-conditioned apartment with a separate living room, an LCD TV and a kitchenette with a microwave. Free Wi-Fi is included. An air-conditioned studio with free Wi-Fi, an LCD TV and a kitchenette with a microwave. Please note that the existing bedding in this studio cannot accommodate any children. One baby cot is possible upon request.